49,000 year old Neanderthal bones have been discovered by chance in a remote, mountainous region of Northern Spain. The bones may help solve the biggest Neanderthal puzzle of all – why we are here today and Neanderthals are not. ‘The Neanderthals’ dark Secret’ revolves around ongoing investigations deep inside the forbidding subterranean cave system called El Sidrón. Here, Palaeontologist Antonio Rosas and Archaeologist Marco de la Rasilla are in their 11th year of excavation. Bones from at least 12 people and 400 stone tool fragments have been recovered. We’ll bring these people back from the past. Our haunting, hologram-like Neanderthal characters, will communicate to the scientists of today, as they unlock the secrets of El Sidrón. Many mysteries surround the site, foremost, how the bones and tools came to be here in the first place. The remains aren’t weathered nor do they show signs of scavenging from large animals. But there are other marks that tell a shocking story of how this group of six adults, three teenagers, two children and a baby may have met their death. Some bones have deep cuts, long bones are cracked and skulls crushed – distinct signs of cannibalism. Was it a result of ritual or hunger? What happened here 49,000 years ago will take us on a much bigger journey – from El Sidrón to the other end of the Iberian Peninsular where scientists are excavating underwater, beneath the Straits of Gibraltar. Here we meet Professor Clive Finlayson who believes he has found the site where the last Neanderthals lived. But like so many theories about Neanderthals, Finlayson’s is difficult to back up without hard evidence. El Sidrón may change this. 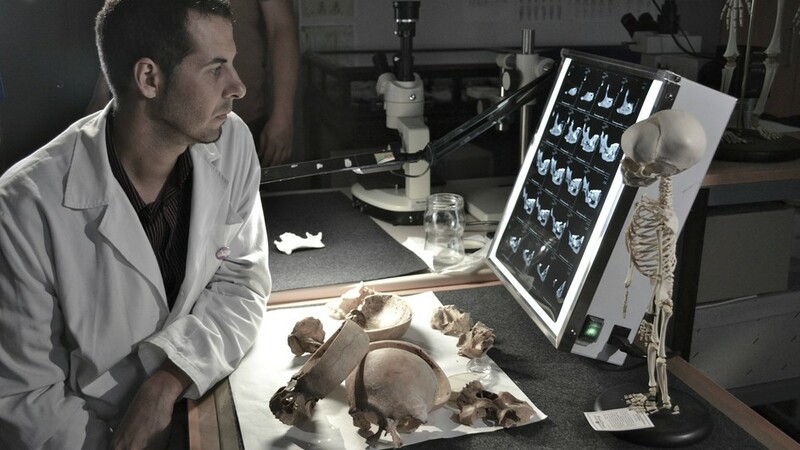 In a Barcelona Laboratory we meet Carles Lalueza-Fox, one of the world’s leading geneticists involved in the cracking of the Neanderthal genome. He has found that seven of the group from El Sidrón came from the same lineage, four to a second and one to a third. He believes this group must have been closely related. They are the first Neanderthal family ever to be found. Can the find also help us estimate the characteristics of other Neanderthal groups, even populations across time? Could the fate of this Neanderthal family help to reveal the fate of their kind?